I’ve complained before about Gordon & MacPhail miniatures not having the same information on them as their bigger counterparts. I didn’t hold out much hope of matching a review against either of my minis of Pittyvaich until I saw “Bottle Code JE/AAB” on Whiskybase. I thought it looked familiar, so I examined both my bottles. Sure enough, looking through from the back, I could see “JE/AAB” printed on the reverse of the front label. This means one of my bottles (left in the picture below) was the first ‘Connoisseurs Choice’ release in 2005. Distilled in 1993, this whisky is 12 years old. Scoring 77.4/100 on Whiskybase isn’t brilliant with comments of “light and unimpressive” but also “a bit unusual (in a good way)”. Having bought these bottles from an online auction, I had no idea I was getting a 12yo and a 16yo. Either I will do a taste comparison, or keep them as an investment. 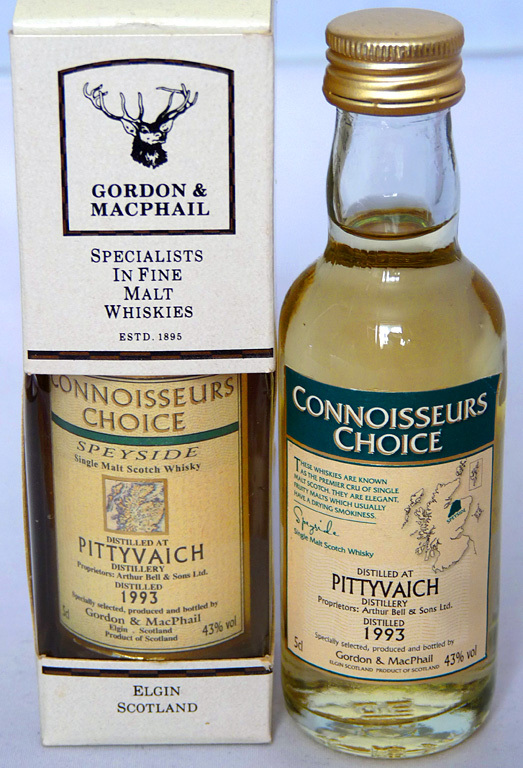 Pittyvaich distillery closed in 1993 so even miniature examples will be increasing in value.